Tsukishima and Tsukuda are on an island in the Sumidagawa River just as it flows into Tokyo Bay. It is very close to Tsukiji Market and offers two local foods of Tokyo, monjayaki at Tsukishima and Tsukudani at Tsukuda. Monjayaki is just one of those foods that everyone should try once in their life if they are wanting to experience different types of Japanese cuisine. I love coming here with my girlfriends, drinking cold beers over the hot stove. The “Monjayaki Association” has a stand near the exit of the subway station and they will give you maps. If you know where you want to go they can show you where it is on the map and how to get there. They are not very good at answering your question about which place is the best. Tsukishima near Tsukiji is ground zero for monjyayaki. Similar to the more famous okonomiyaki of the Kansai region, monjayaki is made from a thinner base. Instead of a thick, savory pancake, diners eat thin, crispy bits right off of the teppan (iron) grill, using a small, tiny metal spatula. The environment lends itself to drinking beer or other chilled drinks to keep cooled down while eating off of the hot grill. It’s good to try while you are in Tokyo as you won’t see it much outside of the city. If you like being in the kitchen, then monjayaki is great fun as you cook your own meals on a hot iron grill that diners sit around. Best to have the wait staff make the first one for you, which they will. 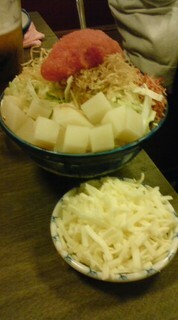 The base monja mix has many variations. A popular combination is mentaiko (spicy cod roe), mochi (sticky rice taffy), and cheese. An Italian version would be tomatoes, cheese, and pesto, or a Korean version may include kimchi and thin sliced pork. Ask at the shop if they have any original specialties and try them. The best time to come is in the evening as the main street, Nishi Naka Dori Shoutengai, is closed off to cars making it easy to carefully peruse the shops before deciding on one. Most of the shops have low tables at tatami mats so if you are not flexible, look for a shop with tables and chairs. In selecting a shop, go with the one that gives you a warm welcome. Okame Hyottoko is open for lunch if you come during the day. The friendly staff can help you navigate over 100 options. Okame has two other shops in the area if this one is full ask them to direct you to the other ones. 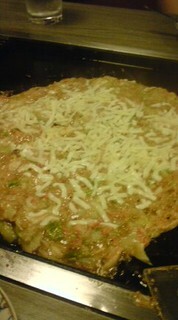 Good memories of okonomiyaki from many years ago — looking forward to trying monjayaki on a future trip to Japan. Mentaiko sounds especially good. I look forward to hosting you in Tokyo someday!